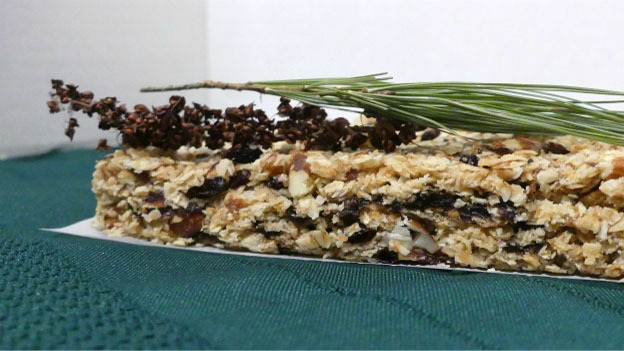 No need for supplements with these nutrient-dense granola bars. They are chock full of vitamins and minerals that your body needs. Stir the first three ingredients together then spread them over a parchment paper-lined baking sheet. Toast in the oven 5 minutes, mix around, and then toast another 5 minutes. Reduce oven heat to 300°F. Place in bowl being mindful of the heat. Add the wheat germ, yellow dock flour (and pine flour if using this) and hemp seeds. Mix well. In a small saucepan place the butter, sugar, honey and vanilla. Blend well and bring to a boil. Remove from stove and using a spatula, add to the dry mixture. Mix well. In a processor place the fruit. Process until the fruit is in small pieces. Add to the mixture and if necessary, use your hands to mix thoroughly. Place combined mixture into a parchment paper-lined glass oblong baking dish (9”x13”). Press the mixture into the dish until all corners are filled and the top is flat. Bake 25 minutes. Let cool at least 2 ½ hours until cutting into granola bar shapes. Will store in fridge 5 to 7 days.